Feelings of passion and love can make us so joyful. When they bring along with them intense attachment, they can also turn very painful and destructive. Love is such a sought-after feeling that entire industries are built around it. Love is a TV genre, a movie genre, a book genre. Magazines obsess over and feed the ideal of romantic love. And yet so much of what passes for love leads to disappointment and pain. It’s these two sides of love—the joy of connection and the pain that comes from attaching and clinging—that meditation works with. When we fall for someone or something (face it, human beings are so easily lovestruck we can fall for a car, a cell phone, or a brand of body wash), we feel pulled in the direction of the love object. When it’s a person, we feel a little lightness in our head, and warmth in various parts of our body. We can literally become weak in the knees. We are pulled out of ourselves and want to connect, so we flirt or touch or dance; or more. The connecting part seems so natural. We form bonds with all sorts of people with degrees of connection varying from the mildly warm to the wildly passionate. But sometimes the power of the passion can be so great that we don’t just want to play and interact with the object of our love. We want to possess it, and own it. We grasp and cling, and we become uncomfortable—in the worst case scary. We are stalking prey. When the game of love is played for keeps, it can take everyone involved into some unpleasant emotional territory. The main meditative practice for love—as with anger—is to shine the light of awareness on your thoughts and feelings, so you can discern the differences between openness and clinging. Keep noticing, without judging, what’s happening in your mind and body. Another beneficial practice is to broaden our love and caring to encompass more people. This kind of “Universal Love” is beneficial to our own well-being and to those around us. It can also reduce clinging in all kinds of relationships—from the love for a child, sibling, or parent to the passionate love for a sexual partner—because it takes the focus off of me…me…me. Visualize others and repeat phrases of well-wishing. You can start with yourself (be kind to yourself), then think of a loved one, then someone neutral, then someone difficult, then, if you like, the whole world. Repeat the phrases a few times with each type of person. May (I/they) be at ease. 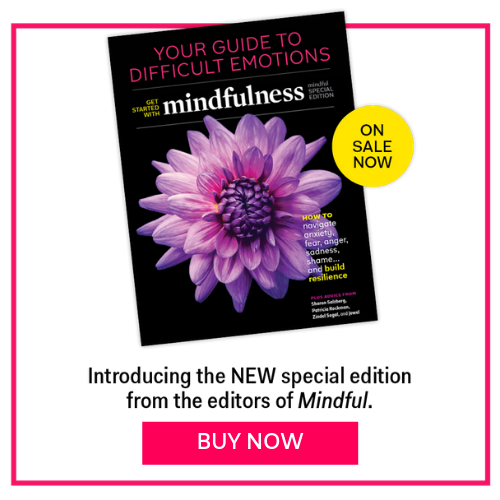 The Mindful Getting Started: Emotions series was compiled by Barry Boyce, editor-in-chief of Mindful, in consultation with:Jeffrey Brantley, MD, director of the MBSR program at Duke University’s Center for Integrative Medicine. Author of Calming Your Angry Mind. Vinny Ferraro, meditation teacher and senior trainer, Mindful Schools. Stefanie Goldstein, Ph.D., clinical psychologist and co-author of the audio program: Mindful Solutions for Addiction and Relapse Prevention. Christa Turksma, child-clinical psychologist and specialist in developing mindfulness for teachers and families.